Members of PSBA educating on bees at the West Seattle Sustainability Fest, June 5, 2010. 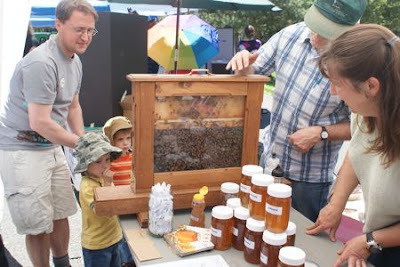 Yesterday I spent the afternoon at the West Seattle Sustainability Festival, in the Puget Sound Beekeepers booth. Our club was there selling our club’s honey and educating folks on bees. We had a couple of observation hives there, which seem to mesmerize all ages of people. (see pic above). When I signed up for the booth, I was actually kind of dreading giving up 2 hrs of my time on a sunny day in seattle…but, once there, I was immersed in telling everyone about bees! I ended up staying for 4 hours without even noticing the time pass. I guess I love talkin’ about bees. In the process, I think I unintentionally recruited at least 3 new beekeepers- all women- just by spending a few minutes answering their questions. (while eyes were glued to the observation hive- the bees were working their charm!) Each woman was extremely interested in bees. One even had previous exposure to bee research from her college days… but they all were hesitant to start into beekeeping, mainly because they didn’t have enough info or support to begin as an urban beekeeper in Seattle. They thought it took alot of space or they didn’t know where to start. I explained how I live in a condo and that I’ve leveraged my garden-rich friends to offer up space for my hives. I told them about our club meetings and beekeeping mentors. There were no more excuses…they each said they were going to be at our next club meeting to learn more- and to get started as beekeepers. how exciting! While at the festival, the Frequently asked question I was asked, was what’s killing the bees? quickly followed by, How can I help save the bees? (especially if I don’t want to/can’t be a beekeeper). While I offered some good general answers to those questions, such as: support local beekeepers, avoid pesticides and plant friendly plants…. I wanted to be able to provide specifics. Hoping that, with specifics, people will more easily take action. Thus, I’m pursuing a path of research and planning- to educate (myself) and others on possible causes for bee decline and how we can help- specifically. As a start to gathering such info: I used my break at the festival to check in at the Master Gardener booth. The gardener there seemed excited to help support me. I walked away with lists of bee friendly plants and a contact for collaboration in creating some educational materials for future booth events and beyond. Specifically- avoid neonicotinoids: Even more specifically, avoid Imidacloprid. I’ve read that pesticides of the class “neonicotinoids” are lethal to bees. Symptoms of this class of pesticides in bees includes death, and if not death- disorientation- i.e., not being able to get to food sources and back to hive- the very life of a bee. ( Of note: these symptoms are strikingly similar to the hallmark symptoms of “colony collapse disorder”, or CCD. However, neonicotinoids have not been identified -as of yet-as the sole cause of CCD). Neonicotinoids have been banned or limited from use in Germany, France and Italy, given concern over the lethal effect on bees, and health effects on humans. In those locales, bee populations have improved. See link #4 at bottom. However, the U.S. still allows neonicotinoids to be used (and plentifully) in agriculture (e.g., beets, corn), in termite control in your home, as well as in common lawn/plant care products – which you can buy in any hardware or lawn care store. (Imidacloprid is the specific neonicotinoid found in these products). Imidacloprid has even been found (and allowed by the EPA) as a contaminate in sugar, since imidacloprid is regularly used in beet production, ultimately ending up in beet sugar. (see health effects to humans in link #1 at bottom). This fact is important to you as a consumer of sugar and to beekeepers. (Beet Sugar comprises 55% of refined sugar consumption in the U.S., and Beekeepers regularly feed 1:1 sugar syrup to bees during times of low nectar flow). Neonicotinoids are absorbed into the plant structure and soil (depending on the method of application). See link #3 and #4 at bottom. The pesticide will live there and be effective at killing insects over a long duration- meaning: treating a crop, tree, lawn, or plant with this stuff will cause pesticide to remain IN the plant or soil- and if bee comes in contact with it (or the pollen produced from the plant)…it means a likely death for the bee (and other beneficial insects- butterflies, ants, spiders, the like). This also means, even if YOU don’t apply the neonicotinoid pesticide, you could unknowingly purchase a plant at the store which HAS been treated, and plant it in your yard. Perhaps unknowingly, you are wreaking havoc on insects such as bees. Scary. Even more scary are the effects of imidacloprid on humans- read content from link #1 at bottom of post. What can you do to help bees (and other beneficial insects)? Avoid use of neonicotinoids, and buy plants which have not been treated with them. If you don’t know, ask the producer of them. Rose bushes, Fruit trees, beets, & certain ground covers are commonly treated with imidacloprid as they are grown. (I’m working on a list of these plants). You should also know the common lawn and plant care products which contain neonicotinoid class pesticides. Once you do, you can avoid them and educate your neighbors about them. Here’s a petition, urging for the ban of neonicotinoids. The Sierra Club has a campaign to save the bees and recommends a documentary called “nicotine bees” to understand the impacts from neonicotinoids on bee populations. From the packaging of these products, the sales and marketing message is to kill insects for beautiful lawn, rosebush, tree, etc. And, the packaging very prominently displays the fact that the killing effect will last for a long duration of time – “with just one application!” (12 months). You will know this is dangerous stuff when you buy it based on the labels, but perhaps you won’t realize (or don’t want to think) of all the downstream effects from using it. Naively, before my trip to Home Depot, I’d hoped that most people had figured out ways around using insect killers (especially here in the ecofriendly and eco-conscious seattle). I’d hoped there’d be a sign saying- “we don’t offer these products because….”. If that didn’t exist, I thought there wouldnt be that many imidacloprid containing products available -and there’d be dust on the products on the shelf. Insead, to my dismay, there was an entire aisle devoted to these types of products- lots of stock, no dust. Curiously, I noticed none of the packages included a picture of a dead honeybee. They did have pictures of scary looking aphids and caterpillars – portrayed as the intended evil targets, though. I guess those marketing folks think putting a dead honeybee on the packaging would deter a consumers choice in buying, especially given all the publicity about bee decline and importance of bees on our food supply. No, I guess they wouldn’t go that far in marketing all the possible impacts from using their products. This was my first day on the task of documenting specific answers to “what’s killing the bees?” and “how can I help save the bees?”. I am no expert, but will continue to compose more specifics for your consideration, in future blog posts. In the meantime, I encourage you to do your own homework. Think through your day to day choices, and consider more bee-friendly (and human friendly) options, for all our sake. Some resources I used to write this-are below in the links. Most of these are captured in my twitter feed (to the right) too. (I usually send them there first, when I run across them.) So , be sure to follow me on twitter, for regular updates on source info I discover. Over time- I’ll recap what I find in blog posts, such as this one.